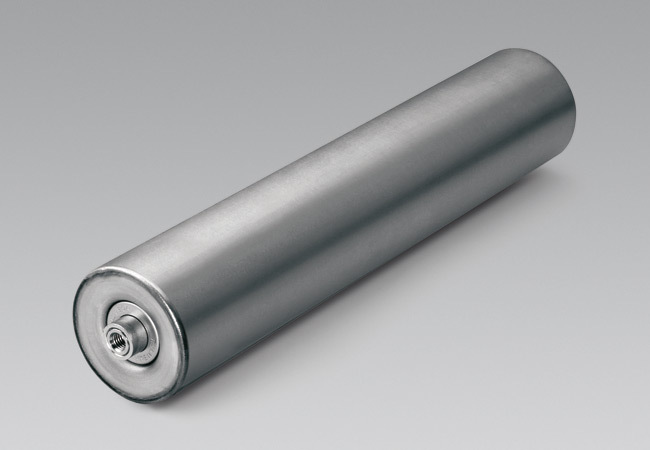 Idle rollers for medium and heavy weight conveyor systems in internal, external, normal, dusty and humid environments. Idle rollers for medium and heavy unit handling conveyors in internal, external, normal, dusty and humid environments. The MPS rollers have been employed for more than 40 years in the most important belt conveyor applications, enhancing their use in the severe environmental conditions in industrial handling systems as well. The end-caps, gauged to ISO M7, are welded to the tube forming a monolithic structure (UNIBLOC). The permanently lubricated are precision radial rigid ball bearings 6202 type. The sealing system is guaranteed by the MECA sealing, composed by the metallic cover, the centrifugal labyrinth seal and by the internal cap which retains a big quantity of grease. The steel drawn shaft has a standard drilled and threaded execution M10 for screw fixing or alternatively has metallic bush ch17. The application temperatures range from –20° C to + 100° C.
The perfect balancing, the low start resistance, the strength and suitability to high speed applications are the main features of the series.